Welcome to the website of Esher Molesey Garden Society. In 1917 the Esher District Allotments and Home Produce Association was founded and continues to this day as the Esher Molesey Garden Society (E M G S) having provided its members with 100 years of continuous service to the local community. Your society will be 100 years old this year and to mark the occasion we have several events lined up. Firstly we are delving into our files and collective memories to provide an account, hopefully with photographs of our progress during this last century. This will form part of our lecture programme in the autumn, so look out for details in our newsletter. Secondly to mark this achievement members of the Society are exhibiting at the Hampton Court Flower Show (Tuesday 4 July �Sunday 9 July). 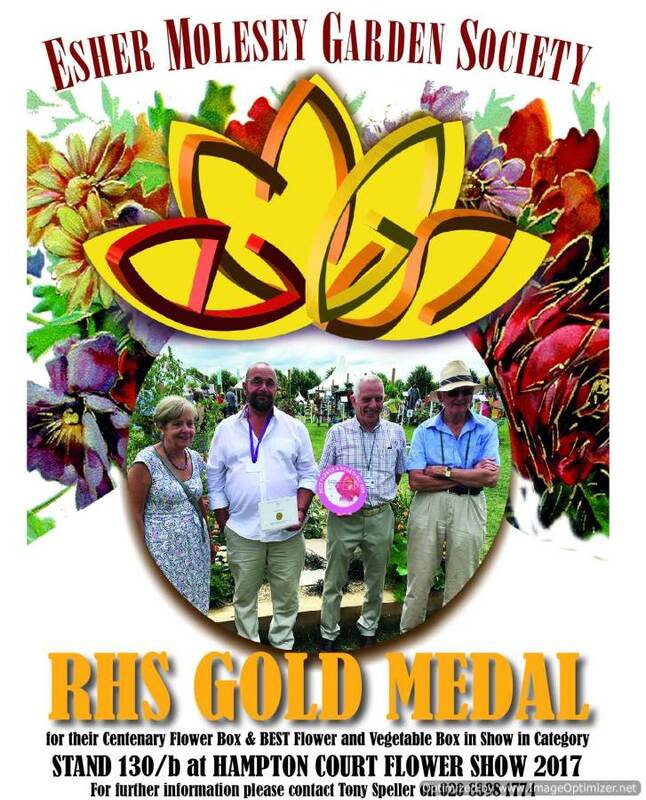 We are pleased to report that we have won a RHS GOLD MEDAL for our Centenary Flower Box and the award for BEST in Show in the Flower and Vegetable Box Category. This is tremendous result and very well deserved by the whole team and they should be congratulated for all their efforts. Please come and enjoy our exhibit, full of joyous colour, which is at site 130b at the Show. And finally we have our annual Show on the 19 August which will be formally opened by the Mayor Councillor Rachael Lake at 2.00 pm and hopefully as many members as possible will join us. Also as a special challenge the cookery section will include a WW2 recipe for a familiar but also rather different chocolate cake. The present membership approaches 700, made up of 400 full members and about 300 affiliate members from several Allotment Associations in the area. The Society relies on volunteers to run its various activities and events. The Society is affiliated to the Royal Horticultural Society, The National Dahlia Society, the Royal National Rose Society, the National Vegetable Society and the Surrey Horticultural Federation. Full membership of the EMGS includes all members of the same household for a yearly subscription of �5.00. Other terms e.g. 5 years and life are available. You will know if you are a full member because you will have received a membership card from the Esher Molesey Garden Society with the Society�s logo. The envelope your card comes in will have the date when your membership expires in red on the address label. Only Full members can enter the draw for Hampton Court Show tickets and have free entry to lectures. Each year eight lectures, one per month February to June and September to November inclusive, are available free to full members. These are very popular and often there is a selection of Trading Depot stock available to buy. Meetings are normally on the first Monday of the month at 8 p.m. in St Nicholas Church Hall, Thames Ditton. Four times a year a newsletter is distributed to all members, mostly by volunteers. These give details of the Society�s activities over the coming months and as appropriate include an annual depot price list or the Show schedule. Members for whom the Society has an e-mail address are up dated on news between newsletters. A major event in the Society�s calendar, The Annual Flower Show is now held during August in St Nicholas Church Hall in Thames Ditton. The schedule includes classes for flowers, vegetables, fruit, home-baking and photography with special classes for children. There are stalls selling produce and a wide choice of plants, with tea and cakes also available to complete the afternoon�s enjoyment. By long tradition the Trading Depot, run by members for members, provides a wide range (some 800 items available) of gardening supplies, often at 25% or more below normal retail prices. Products available include fertilisers, garden chemicals, tools, seeds, onion sets and seed potatoes and if not in stock items can usually be obtained to order. Located on the Beauchamp Road Allotment site the entrance is between houses 104 and 106 Beauchamp Road, West Molesey. The Depot comprises two buildings forming a self service shop with a store for more bulky materials such as composts and fertilisers. The Depot is open every Sunday morning from 9 to 11 a.m. and during spring and summer on Wednesday evenings from 7 to 8pm. The Society always has a very successful stand at Molesey Carnival selling plants and garden sundries. Other trips/activities are planned each year on an ad hoc basis. Email addresses : updates have been sent to most of those who have given us e mail addresses. But a few were rejected by the system as undeliverable. If you haven't received an email please contact Jim Walker (enquiries@emgs.co). Use the links in the left hand column to access further pages. Garden events describes what is going on at the current time. The annual Flower Show, our major event, merits its own special section. Bargains available at the Depot are described on the Trading page. While the History page will tell you of the origins and the story of the Society upto the present day.